This relatively modern Austrian grape, developed in the 20th century, makes a juicy, tart red wine that's worth getting to know. 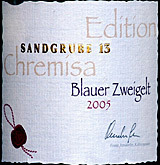  Winzer Krems 2005 "Sandgrube 13" Kremstal Blauer Zweigelt Intriguing, subtle red fruit with a big grind of white pepper and a dash of mouth-watering acidity. Randy Caparoso sings the praises of Lodi Zinfandels, and the WineLovers Discussion Group is talking about recent experiences checking through wine when we travel by air. A few months ago, we took a look at a relatively obscure Austrian grape, "Blaufränkish," also known (among other things) as "Lemberger" or "Limberger." Today let's visit an even more offbeat variety, Blauer Zweigelt ("Blau-er Tsvy-gelt"), a modern cross made by introducing Blaufränkish to another ancient but intriguing Austrian red grape, Sankt Laurent. Today's tasting, a relative rarity, clearly shows the nature of the variety in juicy red fruit, snappy acid and a marked whiff of fragrant white pepper. My tasting notes are below. FOOD MATCH: Its ripe fruit makes a natural match with beef, but its relative delicacy also suggests a pairing with poultry. It was fine with pan-seared rib eye steaks. WHEN TO DRINK: Most will enjoy it within a few years of the vintage, but in Austria it's not unusual to put away a good Blauer Zweigelt for five to 10 years after the vintage.  Randy's Culinary Wine & Food Adventures: Is Lodi making California's best Zinfandels? "There are more Zinfandels of truly exhilarating 'Zinfandel-ish' quality coming out of Lodi, Calif. than from any other single American Viticultural Area," reports Randy Caparoso. Here are some of the best he's found. Amid increased security and rising fuel prices, the airline scene is constantly changing. No liquids in carry-ons, and who knows what to expect in checked baggage? If you have recent experiences transporting wine when you fly, please share them with our WineLovers Discussion Group.